BEAUTIFUL look! i love how u do your eye makeup girl! That is gorgeous! You are so good at eye makeup! I love looking at your EOTDs. What a gorgeous color combo! I love that shade of yellow. 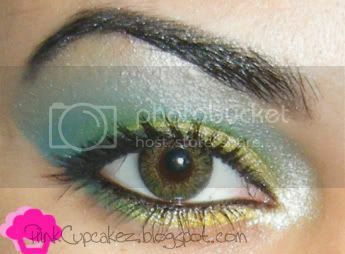 Very beautiful eotd. I read about the skittle vodka on this site and wanted to try it because it looked really pretty. Some of ours didn't come out quite so attractive though. Sooo gorgeous as always you doing! I like your make-up style! 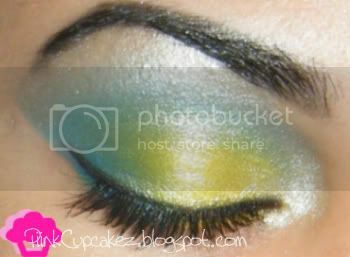 Pretty bright, pretty wearable and sooo cool blending! :( my pigment dont show on me, even with a base. i like this! i think u do ur liner perfect - damn you! wow you look stunning with this look..
you made both of these colors look great together. Its sooo pretty! gorgeous! I love the colour combo. your application is perfect! Wow that is gorgeous! Great work! I'm new to beauty blogging! Check out my blogspot www.niksbeautifuldaze.blogspot.com and follow me! I'd appreciate suggestions and advice!